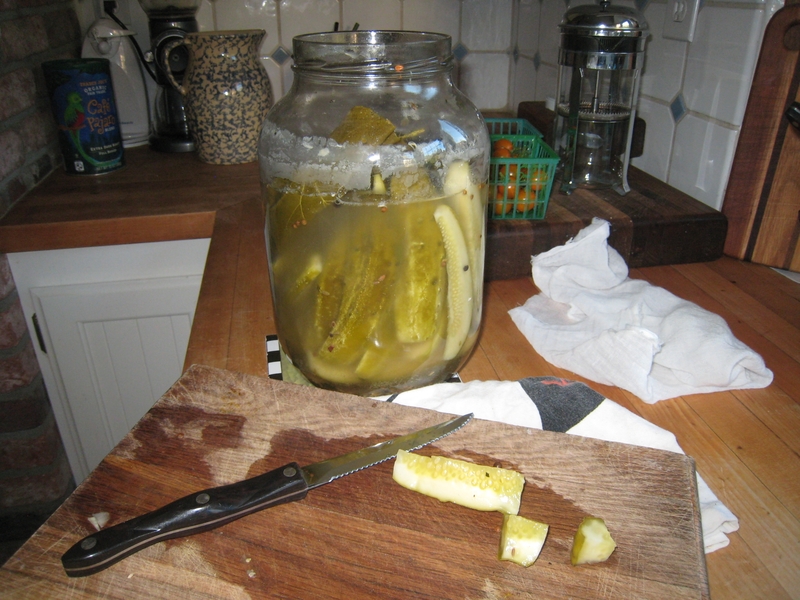 On July 13th we set a gallon or so of pickles into a brine and began to wait. The goal? Sour, crispy, dill pickles. After one week we conducted a taste test. So, the brining continues. The second week’s taste test revealed a more sour pickle deemed still not quite sour enough. The brining can only go on so long before we risk spoilage. Thus, I think it likely that we’ll can these pickles sooner rather than later. Thanks Marisa McClellan for the great pickling advice. We tried Marisa’s recipe…epic fail. We have a new batch of cucumbers from the farmer’s market that we might try starting tonight. Looks like you used fairly large cuke’s, our’s are smaller pickling cuke’s that we just cut the ends off. Did you use alum or cherry leaves for crispness, as Marisa suggested? I was going to in the last batch and forgot…but wouldn’t know how much to add. Also, we tried her spice recipe with one exception: I didn’t have dill seeds so I substituted dry dill (and halved the amount), which may have contributed to the sulferous funk that ensued. We also didn’t like the red pepper flakes. Maybe we’ll try her recipe (with dill seed) but leave out the red pepper flakes. I was a bit confused by the instructions for setting another jar in the opening of the big jar…not sure if we did that right…the object is just to keep them submerged? Do you take any sanitation precautions (i.e. boiling the jars) before starting the fermentation? Sorry to hear about your pickling challenges. I too have had my share of failures. Maybe someday I’ll write about the time my sauerkraut crock exploded. For The Dill Pickle Experiment I used pickling cukes. Since they seemed too large for brining whole, I quartered them lengthwise. I did add grape leaves – five to this gallon. I checked one of my pickling books to get an idea of how much alum to add. 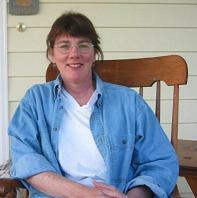 As it happens, that particular book shuns alum due to safety uncertainties. At the time I chose not to investigate that allegation but just left the alum out. I didn’t exactly use Marisa’s pickling spice either. Since these spices are for flavor and not for preservation, you can really customize this mixture to suit your own taste. I used my own pickling spice adapted from Rodale and published in “Stocking Up”. You are correct about the notion of setting another jar in the opening of the big jar. The idea here is simply to keep the cucumbers submerged in the brine. If you don’t weight them down somehow, they will tend to float to the top. I inserted a plastic bowl scraper that’s about 5″ x 3″ into the top of the jar and set another jar full of water on top of that. You can see the set up if you enlarge the pictured titled “The morning of the first day” in the original post – July 13, 2012. Regarding the jar, I always try to sanitize any jars I use in canning. I do this either through boiling (especially if I’m going to use the boiling water bath anyway), running them through the dishwasher (rare), or rinsing them with boiling water, which is what I did in this case.